Do open plan offices and sit/stand desks create as many problems as they solve? 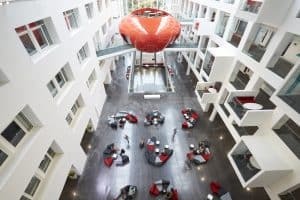 The mainstream media regularly includes articles and, increasingly, advertorials, about the modern workplace, usually office buildings, that are designed to foster creativity, communication, productivity and improve physical health. In many of these workplaces, it quickly becomes apparent that there are never enough meeting rooms for confidential discussions, making the coffee shop in the foyer or a nearby building, essential venues for conversations that would, in the past, be conducted in an office. It also does not take long for a lot of the workers to be at their desks wearing earbuds or headphones in order to negate the noise that the modern workplace allows and creates. This need for isolation and concentration is contrary to the intentions of the office designers. It is not simply a reflection of the modern ipod technology but a human desire for privacy, focus, diligence and productivity. New research seems to indicate that the situation is not helped by sit/stand desks. Dolly Parton sang about working 9 to 5, asked “what a way to make a living” and asserted that it would drive you crazy if you let it. Many workers would look on a shift of only 9 to 5 as a luxury. ABC Radio in Brisbane played this song as an introduction to a series of radio interviews about workplace safety in which myself and Professor Niki Ellis participated on 9 May 2016. Standing workstations – useful, fad or salesmanship? Over the last week Australian media has been reporting on office workers using standing workstations. Given sedentary working has been shown to have negative health effects, standing seems sensible as it increases mobility but is it enough to stand? Or is this recent media attention just another example of shallow writing on occupational health and safety matters, or even media manipulation? The article then quotes the head of office supplies and furniture from an office furniture retailer, Jim Berndells of Officeworks. Its next expert is another retailer of furniture, Office Workstations and its managing director Jovan Vucetic. The attention granted to these retailers along with a mention of the price of a standing workstation and the companies that Vucetic has supplied, seems to imply that the article is less about OHS than about product information. ”….our deliberations over the course of two years have left us in no doubt that the most important single reason for accidents at work is apathy”. It’s 2009 and some of this in various guises[b] still obscures simple facts at work.